We are excited to announce that Elli and Chase Zimmerman will be the Honorary Co-Chairs for North Florida School of Special Education’s (NFSSE) annual Heart of the Runway Fashion Show and Luncheon scheduled for Valentine’s Day, February 14, 2019! We hope you will join this “dynamic duo” for this very special time together. This amazing event could not be possible without the support of our community friends. At Heart of the Runway, you will enjoy beautiful clothes; as well as original art designed by our students. A delicious lunch will be prepared by the talented NFSSE culinary team which will include tasty and fresh all-natural ingredients grown at the school’s Berry Good Farms. Models from the community, along with students from the school, will showcase the latest spring fashions from Linda Cunningham and Dillard’s St. Johns Town Center. Complimentary valet parking will be available for guests. We are also thrilled to share that we have a generous “Heart for ART” Matching Donor for the Fashion Show and Luncheon. Every gift will be matched 100%. This doubles the impact of the donation; $50 becomes $100, $100 becomes $200, $250 becomes $500. 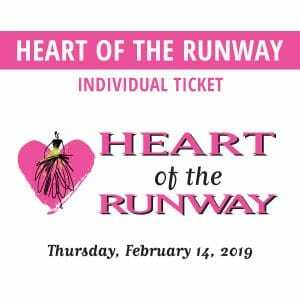 The annual Heart of the Runway is one way North Florida School of Special Education raises funds for our art and enterprise programs. Your support of this event will help to further our mission to discover and foster each student’s unique abilities revealing their highest potential within an engaged community. To purchase your table or tickets, visit the tickets page. For more information please contact Jessica Waugaman at 904-724-8323 ext. 222. We have an option of reserved seating (limited availability) for tables of 6 or 8 guests. Reserved tables will be seated in the Main Room and Gallery, unless another area is requested. Seating is based upon availability. Reserved tables do sell out quickly. • Your donation will directly benefit the school’s various art programs. You and your friends will have a reserved table. • You will receive 20% off your day’s purchase at Linda Cunningham. • You will receive recognition in the event program. A portion of the ticket price is tax deductible.